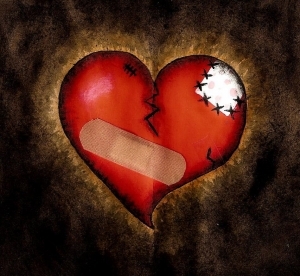 A broken heart (sometimes referred to as heartbreak) is a common metaphor used to describe the intense emotional pain or suffering one feels after losing a loved one. Heartbreak is usually associated with losing a family member or spouse, though losing a parent, child, pet, lover or close friend can all “break one’s heart”, and it is frequently experienced during grief and bereavement. The phrase refers to the physical pain one may feel in the chest as a result of the loss, although it also by extension includes the emotional trauma of loss even where it is not experienced as somatic pain. King David wrote, “Reproach hath broken my heart; and I am full of heaviness: and I looked for some to take pity, but there was none; and for comforters, but I found none” (Psalms 69:20 KJV).” In this Psalm, King David says that insults have broken his heart, not loss or pain. It is also popular belief that rejection, major or minor, can break an individual’s heart. This heartbreak can be greatly increased if rejected by a loved one or someone whom you respect. The heart is the seat of the emotional and intellectual life. “Keep thy heart with all diligence; for out of it are the issues of life” (Proverbs 4:23 KJV), refers to the moral and spiritual as well as the physical life. Animals have simply a sentient heart without personal consciousness or reason. This is what is meant when it is said that a beast’s heart was given to Nebuchadnezzar (Daniel Chapter 4). King David wrote, “He healeth the broken in heart, and bindeth up their wounds” (Psalms 147:3 KJV). Bess Myerson once wrote that, “To fall in love is awfully simple, but to fall out of love is simply awful.” Especially if you are the one who wanted the relationship to last or are the survivors of the recently deceased. Mending a broken heart is never easy. There is no quick way to stop your heart from hurting so much. Isaiah wrote, “Fear thou not; for I am with thee: be not dismayed; for I am thy God: I will strengthen thee; yea, I will help thee; yea, I will uphold thee with the right hand of my righteousness” (Isaiah 41:10 KJV). When teaching in the synagogue, Yeshua read from Isaiah, “The Spirit of the Lord is upon me, because he hath anointed me to preach the gospel to the poor; he hath sent me to heal the brokenhearted, to preach deliverance to the captives, and recovering of sight to the blind, to set at liberty them that are bruised, To preach the acceptable year of the Lord” (Luke 4:18-19 KJV). Regardless of out suffering and persecution upon this earth, we need to remember that it is writtten, “And I heard a great voice out of heaven saying, Behold, the tabernacle of God is with men, and he will dwell with them, and they shall be his people, and God himself shall be with them, and be their God. And God shall wipe away all tears from their eyes; and there shall be no more death, neither sorrow, nor crying, neither shall there be any more pain: for the former things are passed away. And he that sat upon the throne said, Behold, I make all things new. And he said unto me, Write: for these words are true and faithful. And he said unto me, It is done. I am Alpha and Omega, the beginning and the end. I will give unto him that is athirst of the fountain of the water of life freely. He that overcometh shall inherit all things; and I will be his God, and he shall be my son” (Revelation 21:3-7 KJV). I recently lost my father, and I hope some find this short article comforting or obtain some wisdom from it.. Life goes on, and we must as well. I cannot worry about tomorrow. It is written, “Therefore I say unto you, Take no thought for your life, what ye shall eat, or what ye shall drink; nor yet for your body, what ye shall put on. Is not the life more than meat, and the body than raiment? Behold the fowls of the air: for they sow not, neither do they reap, nor gather into barns; yet your heavenly Father feedeth them. Are ye not much better than they? Which of you by taking thought can add one cubit unto his stature? And why take ye thought for raiment? Consider the lilies of the field, how they grow; they toil not, neither do they spin: And yet I say unto you, That even Solomon in all his glory was not arrayed like one of these. Wherefore, if God so clothe the grass of the field, which to day is, and to morrow is cast into the oven, shall he not much more clothe you, O ye of little faith? Therefore take no thought, saying, What shall we eat? or, What shall we drink? or, Wherewithal shall we be clothed? (For after all these things do the Gentiles seek:) for your heavenly Father knoweth that ye have need of all these things. But seek ye first the kingdom of God, and his righteousness; and all these things shall be added unto you. Take therefore no thought for the morrow: for the morrow shall take thought for the things of itself. Sufficient unto the day is the evil thereof” (Matthew 6:25-34 KJV).